(Waltham, MA, Nov. 26, 2012) Women’s Philharmonic Advocacy (WPA) announced today the recipients of its inaugural Performance Grants, intended to encourage the performance of both contemporary and historical women composers. 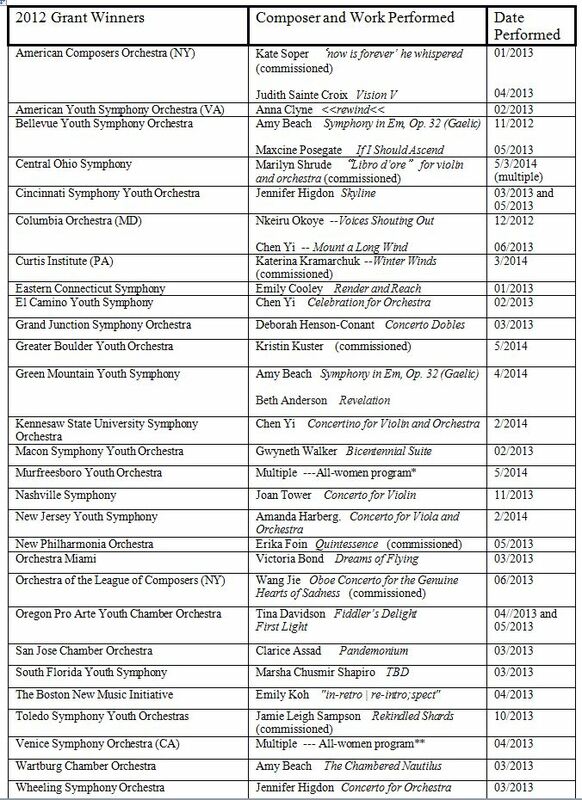 Over $18,000 was awarded to more than 20 US orchestras, with approximately half the funding going to youth or school ensembles. Recipients included the American Composers Orchestra, the Nashville Symphony and the San Jose Chamber Orchestra. In the youth category, Green Mountain Youth Symphony, Kennesaw State University Symphony and Oregon Pro Arte Youth Chamber Orchestra, among others, received grants. “We were thrilled by the range of responses to our grant, and the many creative proposals. These wonderful concerts will do much to highlight the works of women composers,” said WPA President Liane Curtis. Works to be performed will include those by relatively well-known contemporary composers Chen Yi and Jennifer Higdon, historic composers Amy Beach and Lili Boulanger, as well as newcomers just launching their careers. ensemble, but also their overall commitment to programming music composed by women.